Children who meet criteria for ADHD are known to be prone to all types of injuries ranging from traffic accidents to colliding with objects at home. While most of the studies on ADHD treatment concentrate on symptom reduction and school achievement, the small literature on accidents has been inconclusive. A recent paper published in the journal Pediatrics, however, attempts to use a large database to examine this question more fully. umber of trauma-related emergency department (ED) admissions between 2001 and 2013 for over 17,000 youth between the ages of 6 to 19 who at one time were prescribed methylphenidate. The study design was such that each child served as his or her own control. In other words, ED admission rates were analyzed by comparing the number that occurred when the child was taking medication versus time the same child was not taking medications. Incident rate ratios (IRR), similar to odds ratios, were calculated, controlling for age and season. The authors also checked admission rates for ED visits not related to trauma as a control for their findings, under the hypothesis that methylphenidate would have no association in these cases. They also examined their data in different ways to make sure their findings held. Overall, they found that approximately 28% of children in the study had a trauma-related ED admission during the study period. The rate of admission during times children were being prescribed methylphenidate was significantly lower than during periods when the child was not prescribed methylphenidate, with an IRR of 0.91 (roughly a 9% reduction). This effect was found for both girls and boys and was particularly strong for older adolescents, where an impressive 32% reduction was found. Bolstering confidence for the results was that no association with methylphenidate was found for non-traumatic ED visits. They also found similar results when they categorized their data slightly different ways. 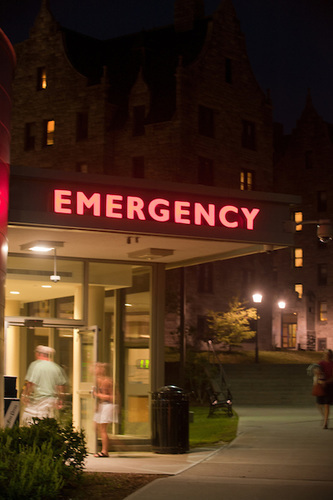 The authors concluded that they were able to detect a protective association for methylphenidate related to traumatic injuries resulting in emergency department visits. The authors suggest that this factor be taken into account when deciding about treatment. In looking at the raw numbers in their Table 1, it appears like these results would not have been significant had they not controlled for age and season. What that means isn’t exactly clear and the authors, unfortunately, did not comment on this. We also don’t know exactly what types of injuries did occur. Lending additional confidence to the findings, however, relates to the study’s design in which each subject served as their own control. The authors state that this aspect helped them reduce bias related to ADHD severity. However, it is also possible that subjects more likely received medication when their symptoms were more severe. If so, then this element would have biased the authors against finding the result that they did. Finally, it should be noted that several of the authors did have financial ties to the pharmaceutical industry. Lest anyone think that this post is all about advocating just for medications, I also can’t help but make reference to a similar study http://www.bmj.com/content/331/7531/1505 done in 2005 in England that showed an association between decreased ED visits for trauma and the release dates of two Harry Potter novels. There is obviously more than one way to help children stay safe. Man KKC, et al., Methylphenidate and the Risk of Trauma. Pediatrics 2015:135:40-48. This entry was posted on Thursday, February 19th, 2015 at 3:10 pm and is filed under ADHD, Medications. You can follow any responses to this entry through the RSS 2.0 feed. You can leave a response, or trackback from your own site.